It’s my everyday mantra, one instilled at the very core of what Salesforce does. When presented with a problem, we want to use clicks, or things we can point and click and configure in the interface (workflow, cross-object formula, etc. ), instead of using code to get things done. However, sometimes what we want to do simply isn’t possible without the help of a little code. For some of the geekier amongst us (ahem), that’s actually an exciting proposition. For most of the rest of us, that idea instills fear, doubt, and dare I say a tinge of Rockwell-esque paranoia. If you’re certain it can’t be done via workflow, rollup summary or validation rules, rest assured, nobody is watching you, you CAN write basic triggers and be proud. Here’s how. While we can download and configure Eclipse, that’s a bit beyond the realm of this blog post, so we’re going to stick with the web interface and cloud deploy. If you’re interested in learning more about about using the Force.com IDE though, definitely check out developer.force.com. First things first, we need to create a sandbox. One of the nice things about the license donation for nonprofits is that we get sandboxes to work in. These are replicas of the schema, or structure of your database (without data), and provide a safe environment for us to test out our code in. 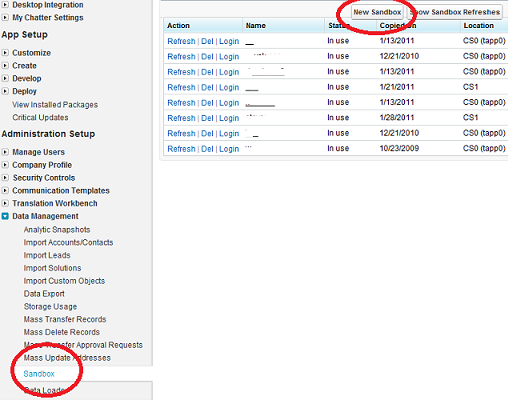 You can create a new sandbox by going to Setup->Data Management->Sandbox, and then click on ‘New Sandbox’. You’ll also need to setup a Deployment Connection between your sandbox and your production org, since we’re going to deploy code using Change Sets. It’s a bit beyond the scope of this post to dive into, but there’s lots of documentation available on how to do this. So in other words, when I do some verb/action to a record (insert, update, delete, etc. 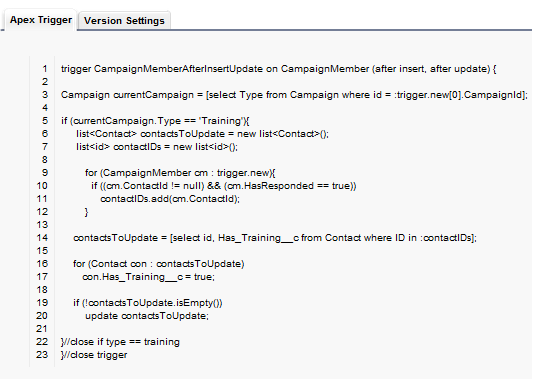 ), Salesforce checks my list of triggers and says: “Are any of these valid here?” Seems easy enough to understand, but WHEN Salesforce checks, before or after my verb/action, is the key to understanding triggers. We’ll discuss that more in a moment. Let’s setup a problem, then talk about the various decisions we need to make before we start coding. 1. We need to handle the fact that we can update multiple campaign members at the same time. 3. We need to make sure if we change them from responded to not responded, we uncheck the box. 4. 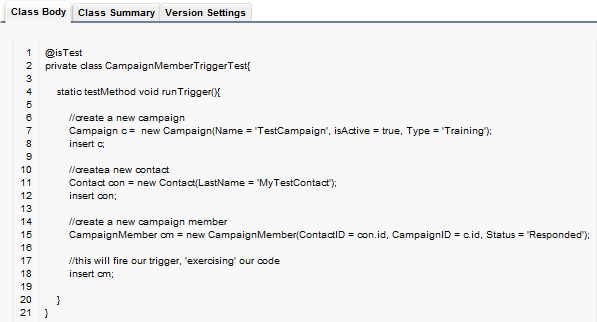 If we delete the campaign or campaign members, what will happen to the checkbox? When should this trigger fire, before or after my action? Oddly, in this case, we could do either, since we’ll have the value for our contact available to us when we insert the record. 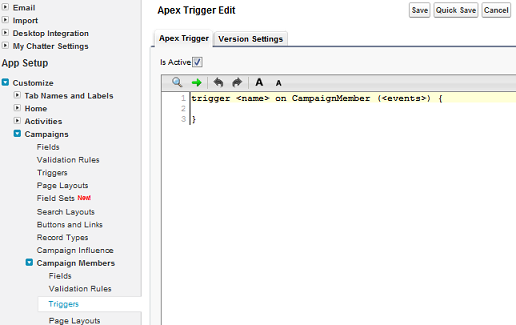 However, if we were reliant on a formula field, workflow, or rollup summary value, we’d always want to use the after trigger, since that only fires after everything else happens on the record. In this instance, we’ll use the after trigger for simplicity. The most common use-cases I’ve seen for before-triggers are really complex custom validations of records, as well as de-normalization for reporting, but there are plenty of others as well. This is by no means a gentle 101 introduction. Writing code can be tough but incredibly rewarding, not to mention efficient in many cases! Salesforce actually makes it alot easier than it used to be by providing you with some great tools and abstractions to make the job just a tad more intuitive. Hopefully this will empower/inspire you to dive in and get your hands a little dirty. Here’s a quick secret: I was a political science major as an undergrad. Like many people, learned how to code by diving in head first, chewing through tons of test environments, and occasionally (okay, often) crashing the family computer in my younger years (nice thing about Salesforce? Can’t crash your computer anymore :)). The great thing about a sandbox is you don’t need to worry, its there for you to play in and learn the ropes, so don’t be intimated by what we’ve worked through. I’d also encourage you to read some more about triggers, including some best practices around architecture. Finally, if you’re ever interested in peeking under the hood of the Nonprofit Starter Pack to see how we code triggers, classes or test methods, I highly encourage you to check out our Google Code repository, where the actual NPSP code lives. You’re free to browse, download, share and learn. It’s entirely open source and has contributions from many different individuals throughout our community. What will you add with your new coding skills? ?